90% & 40% US Silver Coins. 1/4 oz Australian Kangaroo/Nugget Gold Coin. Along with 1 kg and 1 oz sizes, Australian Kangaroo/Nugget Gold coins come in fractional sizes too so that it is affordable to all population. These are the only bullion coins other than Chinese Gold Panda to change the design on the reverse each year. These coins are internally recognized and popular for their high numismatic value and intrinsic value which attracts both collectors and investors towards it. First minted in 1986 at Perth Mint, these are legal tender bullion of Australia. 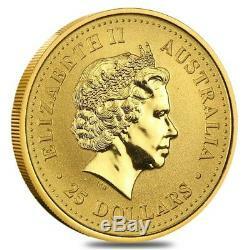 Is pleased to offer the 1/4 oz Australian Kangaroo/Nugget Gold Coin (Random Year) in Brilliant Uncirculated Condition. Struck at the Perth Mint. Based on the availability, dates and designs will be chosen. Obverse features bust portrait of Queen Elizabeth II. 9999 pure gold, weight of 1/4 troy oz. Legal tender bullion coin backed by Western Australian Government. Has been a front runner in the bullion industry ever since its debut. Once you experience our service, you will never settle for less! By purchasing from Bullion Exchanges, you are agreeing to all of our Terms and Policies. Bullion Exchanges reserves the right to refuse or cancel any order reviewed by our Compliance Team, which are deemed questionable or have increasing potential risk for being fraudulent. All customers are subject to a review at our own discretion, in which additional information, identification and/or documentation, may be requested. The submission of an order and subsequent receipt of a confirmation locks in your order and affects our metal hedging requirements and thus we are unable to make any price adjustments. Our in-house numismatist staff assign conditions to all products. The condition assigned to the products is derived from industry-wide standards. Please keep in mind that most images are stock images, and therefore you should not expect to receive the pictured products. Silver products, and some gold as well, may exhibit milk spots, and/or toning, which are normal and do not change the condition described in the listing, nor the value of the product. Please note, bullion coins, bars and rounds are mass-produced and are not struck to the same quality standards as collector coins. These bullion products are not certified and therefore will not always be 100% perfect. All sales are final and therefore in cases when a product is offered on a Deal Price, previously locked-in orders for that product will not be subject to price reductions or cancellations. Bullion Exchanges reserves the right to cancel sales that may or may not have typography issues within the listings, pricing inaccuracies, systematic faults by our system, and/or errors caused by eBays system, without further notice. Purchasing bullion and/or coins involves price risk, and the purchaser assumes all such risk. We do not offer or make price adjustments based on the market fluctuations of precious metals, or for any other reason. We will never ask the customer to pay more for a product if the price significantly increased, so please refrain from requesting price adjustments after market prices decrease. 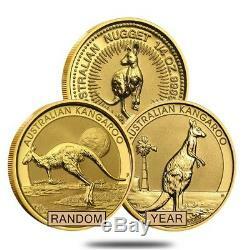 The item "1/4 oz Australian Kangaroo/Nugget Gold Coin. 9999 Fine (Random Year)" is in sale since Friday, October 12, 2018.